The search result in Chinese is not correct. Please see the attached example. This is running unity with Simplified Chinese seledcted and iBus for keyboard input method (see steps below). Searching using Chinese characters does not yeild correct search results even though the Chinese characters appear in the displayed name. Search results are only correct if English characters are entered and this is wrong. * Tab 1: Select iBus in Keyboard Input Method System combo. * Tab2 (named "Regional Formats" in en _US"): Select Chinese and Apply. * enter Chinese character for Empathy for example and it won't be found. enter English characters for empathy and it will be found in applications place. This bug most likely occurs in unity 3d. It's probably not being reported because there is currently no way to enter Chinese characters in unity 3d (see bug https://bugs.launchpad.net/ubuntu/+source/unity/+bug/663776) which is a MAJOR issue for OEM's shipping unity in China. 2. The package name has NOT been localized. I looked into this and was able to reproduce it if I only set my session to zh_CN but not the system wide language. With a systemwide zh_CN setting (and a subsequent update-software-center call) I can see all the text translated. the same data as the display. Attached are two screenshots from my box. To make this work for non-systemwide setups software-center would have to build a index for each installed language. I think I need the hand holding of someone versed in Chinese in order to fix this, otherwise it's like shooting blindly. Are you the man for this Kevin? Please try and catch me, kamstrup, on IRC if so. The upshot is that this will require some work. There are libs we can pull in for this (like http://code.google.com/p/cjk-tokenizer/), we'll then have to manually write some glue code to wire it up in the indexing- and query parsing subsystems for S-C and u-p-a. Looking deeper into the linked Xapian bug it seems we may be able to shoplift some code from the Pinot engine that is based on cjk-tokenizer but ported to glib2 instead of libunicode. As described in the Xapian bug it does depend on the Dijon namespace though so as they've done for the Xapian patch based on the Pinot code we must remove the Dijon usage. As olly describes in the Xapian bug this is slightly dangerous though and may have unpredictable consequences if we ever see Unicode version mismatches between glib2 and Xapian or if they differ in their error handling (which they almost certainly do). All of this still leaves the question open for how to handle this in S-C with Python as it's crucial that S-C and u-p-a use the *exact* same method for tokenization. If there's a mismatch between the query parser in u-p-a and how the indexed terms are generated in the S-C index we'll see no-, weird-, or random results. Xapian should have all the Unicode support you need for this built in, so you shouldn't need to add a dependency on libunicode, icu, or glib. Also, Xapian is taking part in GSoC this year, and "CJK support" is one of the potential projects. We've had promising interest in it, though it's too soon to know if that'll happen, and it wouldn't be done until August anyway. It might also be just Chinese support or just Japanese (or possibly students working on each separately). So a patch with a more generic approach may still be useful (probably would be for Korean at least). I've got some code lying around which is a hacked version of cjk-tokenizer which uses xapian's unicode routines; it wasn't hard to make. I'll shove a copy of it up on github in a moment. It still requires linking into an indexing and query parser, though. @Olly, @Richard: Thanks for chiming in! Afaik we use use Xapian::TermGenerator and Xapian:QueryParser everywhere. So maybe we should aim for Richard's solution for Natty and then hope we get CJK support out of the box for Natty+1. The complicating factor here is that the Software Center index is created from a Python program (and also consumed by that program), but also consumed from a C program (unity-place-applications). So we'll need the CJK support available for Python as well. If it's built into Xapian this is a non-issue of course, but using Richard's cjk-tokenizer for Natty may be too complex for this late point in the cycle (considering we need to add Python bindings for it) - i'll talk to Michael Vogt about this. Hmm, it does indeed seem awfully late in the release process for some fairly major distro-specific patching of xapian-core. It's quite likely there will be a better solution before 11.10, and if not we can probably get the cjk-tokeniser approach in cleanly upstream by then. My thought would be to package the cjk-tokeniser code in its own little C++ library (which can link to libxapian for the Unicode stuff since that's a public API), and then knock up a simple Python wrapper around it (with SWIG or similar or even by hand). Then you can use this for CJK locales, and Xapian's code for others, which means that any breakage won't affect other users of Xapian, and can only break for S-C in CJK locales, where the search doesn't really work currently anyway. Attached a branch with my WIP to add support for CJK handling in Xapian. Development details will be in the Xapian bug tracker. Once there is something to ship/test in Ubuntu I'll put a note on this bug. For reference, here is the summary of IRC discussions on this topic, including support from Platform with regards to a release plan for the fix. closer to a long term solution. 4. At that point, we'd like the test teams in OEM, and CJK users in particular, to control the resulting packages. "1. kamstrup to start integrating the tokenizer + library patch into libxapian"
With my Xapian upstream hat on, that really doesn't seem a good plan to me. It would mean that databases built by anything using Ubuntu's packages of Xapian risks being incompatible with those built on other platforms or with other builds of Xapian. We take a lot of care to avoid introducing any such incompatibilities within a release series, and the feedback I've had suggests users appreciate that. @Olly: Agreed - that's not a situation we want to get into. That's also why we'll kick this off from a PPA so one has to specifically opt in to this and we can put a big fat Caveat Emptor sticker on it. There's been a relevant development too - Xapian has a student working on adding support for a Chinese segmentation algorithm as part of Google's Summer of Code this year. Assuming that project goes well and we can get it merged in, this ticket should be addressed for Chinese. That still leaves Japanese and Korean, which aren't explicitly mentioned in this ticket so far that I saw, but suffer from the same issues. Here is a patch for Xapian, it edits the Term Generator and Query Parser used in unity-places-applications. So everything is handled under the hood of Xapian. This was taken over from Mikkels' branch and where he left off. Which allows for the searching CJK text in the Dash. New patch, hopefully will be merged with Xapian. Hopefully this will be merged with Xapian. Since there is a fix for this bug, is there any way for our colleagues in Asia to help test it and moving this bug forward? Kent Lin: It would be very useful for people who can read these languages to try out Brandon's latest patch, and report if it works well, or if there are any issues. Some more test cases would be good too - I've not had a chance to check the test coverage for yet, but it would be good to have most of the new code covered. 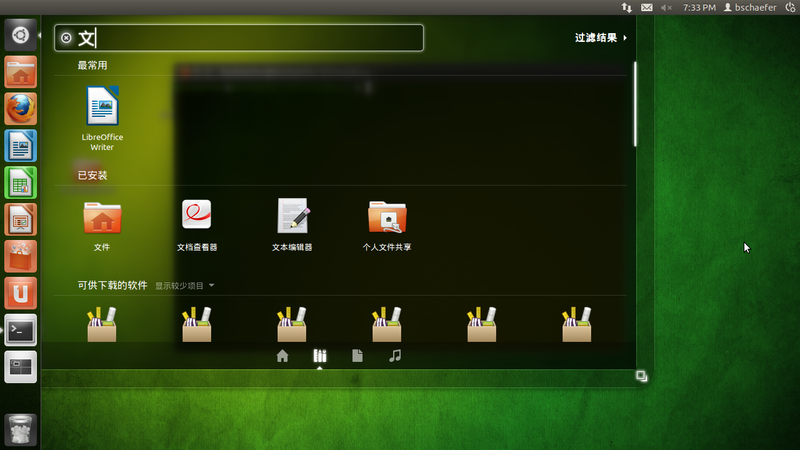 With xapian 1.2.5-2 on Ubuntu 11.10, I see using the same Chinese character for search in the Unity dash returns relevant applications including Empathy. By relevant I mean the Chinese character is in the application names on Unity dash. See attached screenshot, the translated Chinese name of the first and second applications has the Chinese character, but not the third (Sudoku). Another example that it returns relevant but also irrelevant applications. the attachment is a screentshot of this bug. 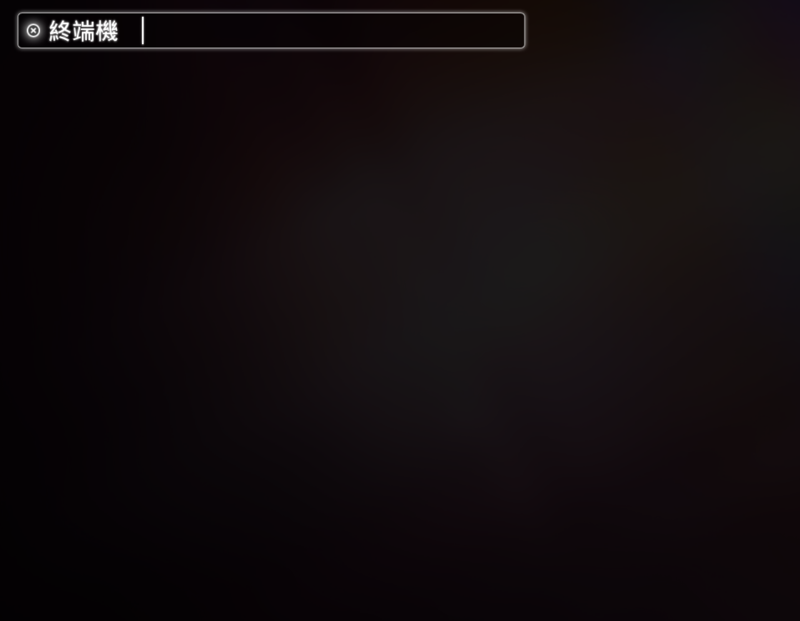 User want to find a application named as "terminal" (終端機 in Chinese), this Chinese word "終端機" has 3 characters , first character is "終", second is "端", the third is "機". The FTS extension for Zeitgeist that serves for indexing keywords for Files & Folders has been fixed to support the new CJK tokenizer in Xapian. Unity-2D is not the source of the issue. All the foundations aspect of the bug have now been taken care of. See previous comments. I'm sorry but no matter what Chinese character I input from Unity 2D dash, it returns nothing. I saw the same issue as Ray said in #37. It is a fresh install of the 0906 Oneiric build. 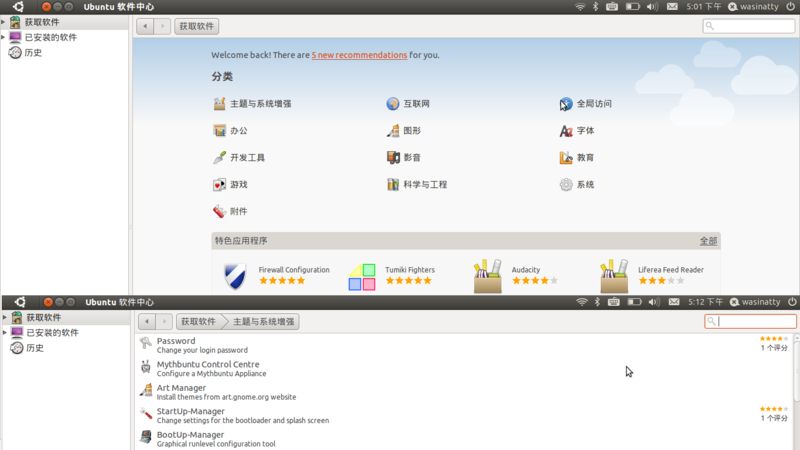 Application name and description are translated after 'update-software-center'. Search by Chinese character doesn't show all expected applications. 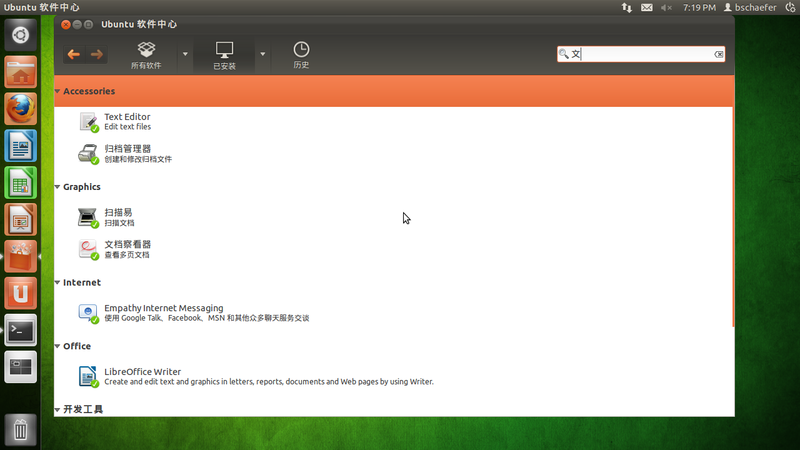 The first window shows 3 applications that have '文' in either the name or the description or both. 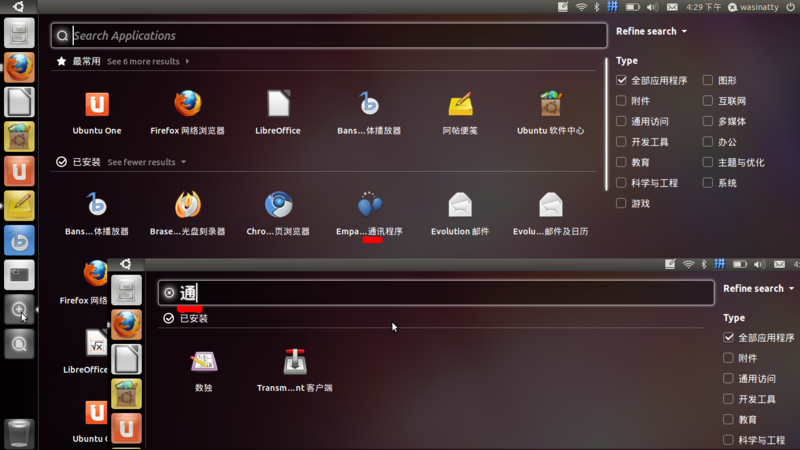 The second window shows search by '文' returns only 2 of those 3 applications. This problem was fixed and is in the current daily build of unity-2d. It was a regression in unity-2d not libxapian. 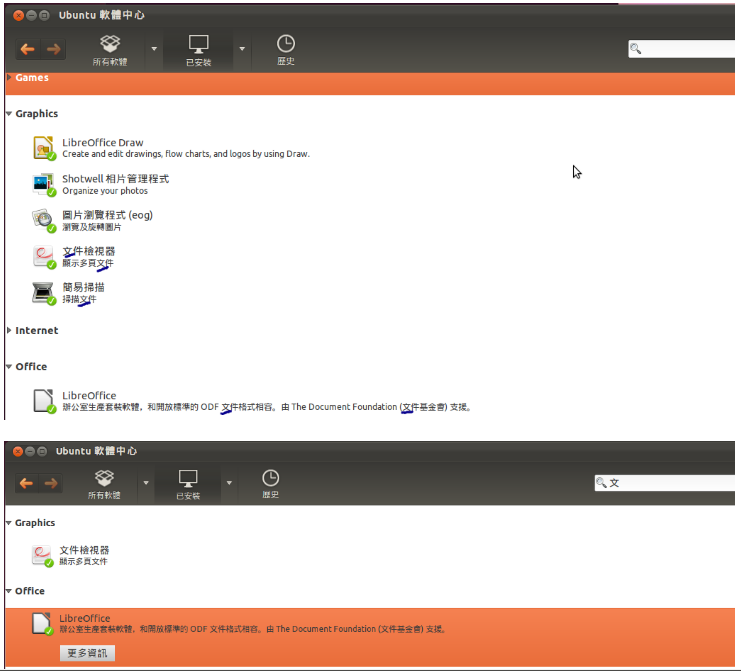 1) Input '播' to search program, it can search 'VLC媒體播放器'. 2) Input '播放' to search program, 'VLC媒體播放器' won't in the search result. 3) Input '播放器' to search program, 'VLC媒體播放器' won't in the search result. Marking the oem-priority task fix released because the main problem was addressed in 11.10. Some additional improvements are desirable; they will be addressed in separate bugs. > will be addressed in separate bugs. My old hard disk was in no good conditions. I have one new and the installation is ok.